^ A flock of sheep much like the one above once prevented me from getting to work on time. True story. Living in Wales was a blast. Let's get one thing out of the way here. I love making new words out of two old ones. Urban Dictionary, one of the greatest corners of the internet, is effectively founded on people artificially ramming together two words that don't get along. Terms like "brofessional", "carnevoyeur" and, of course, "overjaculation" stand as a testament to language's beautiful capacity to constantly evolve and adapt to new surroundings. Sort of. 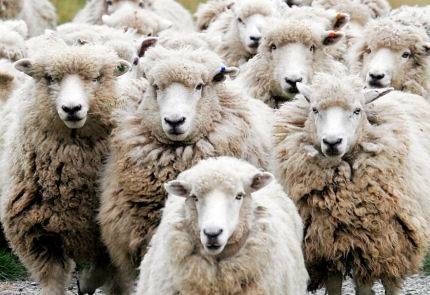 My issue with "sheeple" is therefore not to do with someone slamming together sheep and people - the Welsh do that all the time*. My beef (...lamb?) stems more from the kind of people who use the word and the context within which they deploy their elitist put-down. Almost always veering on the "alt" side of life, they view the "norms" as "sheeple" because they "conform". If you don't make a blindingly shallow statement about yourself being slightly different from the rest of society, then you're just falling in line with the establishment without ever thinking for yourself. Obviously. Now, I don't know what criteria this is generally based on, but as far as I can tell, if you've never worn an Anarchy A t-shirt in your life, then you're probably a sheeperson (clearly no thought went in to a singular form of the word). If you don't have a slightly off-key haircut, then you're probably a sheeperson. If you've never listened to at least some of the collected works of System of a Down, you're probably a sheeperson. The delicious irony in all this is the fact that to not be part of the sheeple - the flock unable to make their own decisions, instead damned to mindlessly conform to the standards of society - you must because an alternative stereotype, unable to make your own decisions about other people and instead damned to mindlessly conform to the standards of your contemporaries' idiocy. If you're going to start stereotyping large groups of people, just make sure you're not also part of an equally idiotic stereotype. *I just burnt myself there.